There are generally five major factors affecting Canadian gold coins< and any other gold coins at the market. 1. Rarity of gold coins is perhaps the top determining factor that is directly correlated with gold coins scarcity. The fewer the coins the higher the value for them. 2. Canadian gold coins value is also determined by coins’ grade or the condition they are in. Coin grading system recognizes many different variations of coins ranging from poor circulated, uncirculated and proof grades. 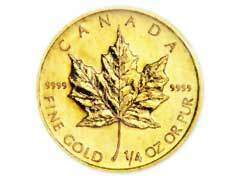 The higher the grade of the gold coin the higher the Gold Maple leaf price, for example, is going to be. 3. Gold content value of a coin is directly correlated with a spot price of gold. The general rule is the higher the inflation rates are the higher the spot price of gold is going to be therefore purchasing Gold Maple leaf coins creates an excellent recession proof investment. 4. Canadian gold coins value is also greatly affected by collectors’ and investors’ demand. The higher the demand the more money you should expect to pay for your Canadian coins of gold. At times coin demand is prone to fluctuations and changes in investor preferences. This is why some leading gold investors stay away from rare historical coins and buy exclusively Canadian gold bullion coins. 5. Quality of your gold coins should not be taken out of consideration, on the contrary, Canadian gold coins value is higher when particular coins have more aesthetic appeal and will therefore sell faster. Quality is the hardest factor to determine and sometimes could only be done by a professional coin grader.